Earlier this week, the popular language learning service Duolingo quietly introduced paid monthly subscriptions in its Android apps. The new subscription service, which you can buy through an in-app purchase, currently costs $9.99 per month. It’s live now on Android and will come to iOS in the future. Update: a Duolingo spokesperson tells me that the company expects to break even (or come close to it) by the end of the year and that the company has a “fully fleshed out monetization plan.” We have updated the headline to reflect this. About a year ago, Duolingo CEO Luis von Ahn announced that the company would start experimenting with ads and optional in-app purchases to figure out how each would impact app usage and the financial health of the company. At the time, von Ahn said that Duolingo was spending about $42,000 per day on its servers, employees and other operating expenses, a number that has surely increased over the last year or so. “Subscribers will help keep language education free for millions of people around the world,” von Ahn writes in this week’s announcement. 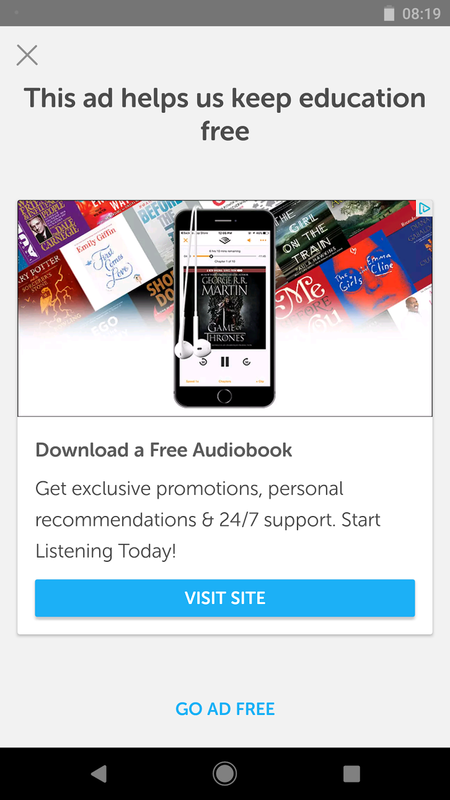 Ads in an educational app are always a difficult tradeoff between monetization and user experience because they are, by default, designed to take the user out of the app. Von Ahn acknowledged as much. “I don’t like ads any more than you do, but we need to test if a small non-intrusive ad at the end of a lesson makes people use Duolingo less. (We know this would take us a long way towards breaking even. ),” he wrote a year ago. Now, however, it doesn’t look like ads are going away anytime soon, because not seeing ads is, after all, one of the main benefits of paying for Duolingo Plus. The original idea for monetizing Duolingo was to use the combined brainpower of its users to power a translation service. This service, however, remains in beta after all these years and the company doesn’t really highlight it anymore (and as far as I can see, there’s not even a link to it from its homepage at this point). Duolingo’s mission is to “provide free language education to the world.” Having talked to von Ahn many times in the last few years, I know that he’s extremely passionate about this. At the same time, though, Duolingo also took almost $84 million in venture funding since it launched in 2011 — and those investors surely want to see a return. It’s worth noting that Duolingo’s move here feels a bit similar to that of Berlin-based Babbel, the company’s biggest competitor in Europe. Babbel, too, tried the ad model but found that it couldn’t sustain its business through ads alone. In a last-minute pivot before running out of money, Babbel switched to a paid model and today it has hundreds of employees and runs a cash-flow positive operation. In all fairness, though, its mission wasn’t to offer free language education to everyone, so it had far more freedom to pivot.